The term multi-tenancy in general is applied to software development to indicate an architecture in which a single running instance of an application simultaneously serves multiple clients (tenants). This is highly common in SaaS solutions. Isolating information (data, customizations, etc) pertaining to the various tenants is a particular challenge in these systems. This includes the data owned by each tenant stored in the database. It is this last piece, sometimes called multi-tenant data, on which we will focus. There are 3 main approaches to isolating information in these multi-tenant systems which goes hand-in-hand with different database schema definitions and JDBC setups. Each approach has pros and cons as well as specific techniques and considerations. Such topics are beyond the scope of this documentation. Many resources exist which delve into these other topics. One example is http://msdn.microsoft.com/en-us/library/aa479086.aspx which does a great job of covering these topics. 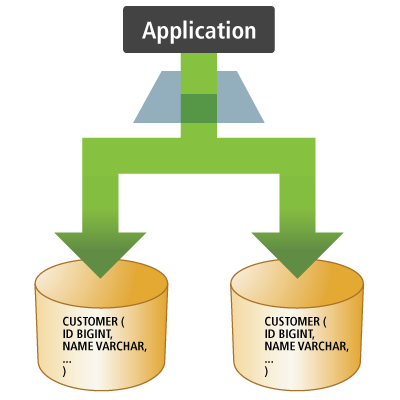 Each tenant's data is kept in a physically separate database instance. JDBC Connections would point specifically to each database, so any pooling would be per-tenant. A general application approach here would be to define a JDBC Connection pool per-tenant and to select the pool to use based on the “tenant identifier” associated with the currently logged in user. Connections could point specifically to each schema, as we saw with the Separate database approach. This is an option provided that the driver supports naming the default schema in the connection URL or if the pooling mechanism supports naming a schema to use for its Connections. Using this approach, we would have a distinct JDBC Connection pool per-tenant where the pool to use would be selected based on the “tenant identifier” associated with the currently logged in user. Connections could point to the database itself (using some default schema) but the Connections would be altered using the SQL SET SCHEMA (or similar) command. 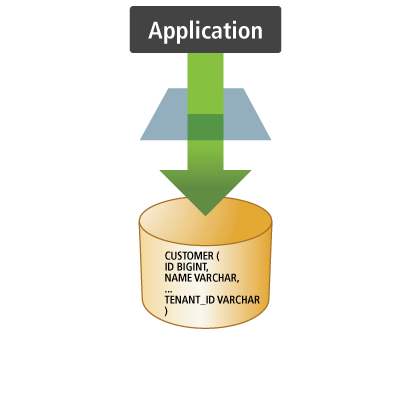 Using this approach, we would have a single JDBC Connection pool for use to service all tenants, but before using the Connection it would be altered to reference the schema named by the “tenant identifier” associated with the currently logged in user. All data is kept in a single database schema. The data for each tenant is partitioned by the use of partition value or discriminator. The complexity of this discriminator might range from a simple column value to a complex SQL formula. Again, this approach would use a single Connection pool to service all tenants. However, in this approach the application needs to alter each and every SQL statement sent to the database to reference the “tenant identifier” discriminator. Using Hibernate with multi-tenant data comes down to both an API and then integration piece(s). As usual Hibernate strives to keep the API simple and isolated from any underlying integration complexities. The API is really just defined by passing the tenant identifier as part of opening any session. Additionally, when specifying configuration, a org.hibernate.MultiTenancyStrategy should be named using the hibernate.multiTenancy setting. Hibernate will perform validations based on the type of strategy you specify. The strategy here correlates to the isolation approach discussed above. (the default) No multi-tenancy is expected. In fact, it is considered an error if a tenant identifier is specified when opening a session using this strategy. Correlates to the separate schema approach. It is an error to attempt to open a session without a tenant identifier using this strategy. Additionally, a MultiTenantConnectionProvider must be specified. Correlates to the separate database approach. It is an error to attempt to open a session without a tenant identifier using this strategy. Additionally, a MultiTenantConnectionProvider must be specified. Correlates to the partitioned (discriminator) approach. It is an error to attempt to open a session without a tenant identifier using this strategy. This strategy is not yet implemented in Hibernate as of 4.0 and 4.1. Its support is planned for 5.0. 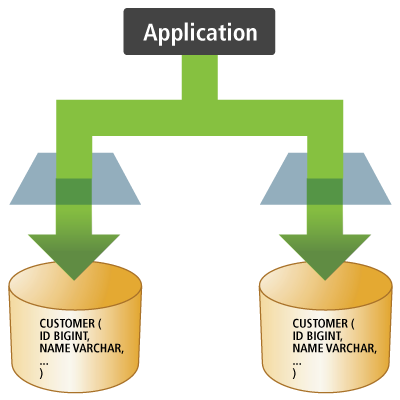 When using either the DATABASE or SCHEMA approach, Hibernate needs to be able to obtain Connections in a tenant specific manner. That is the role of the MultiTenantConnectionProvider contract. Application developers will need to provide an implementation of this contract. Most of its methods are extremely self-explanatory. The only ones which might not be are getAnyConnection and releaseAnyConnection. It is important to note also that these methods do not accept the tenant identifier. Hibernate uses these methods during startup to perform various configuration, mainly via the java.sql.DatabaseMetaData object. Use the hibernate.multi_tenant_connection_provider setting. It could name a MultiTenantConnectionProvider instance, a MultiTenantConnectionProvider implementation class reference or a MultiTenantConnectionProvider implementation class name. Passed directly to the org.hibernate.boot.registry.StandardServiceRegistryBuilder. If none of the above options match, but the settings do specify a hibernate.connection.datasource value, Hibernate will assume it should use the specific DataSourceBasedMultiTenantConnectionProviderImpl implementation which works on a number of pretty reasonable assumptions when running inside of an app server and using one javax.sql.DataSource per tenant. See its javadocs for more details. org.hibernate.context.spi.CurrentTenantIdentifierResolver is a contract for Hibernate to be able to resolve what the application considers the current tenant identifier. The implementation to use is either passed directly to Configuration via its setCurrentTenantIdentifierResolver method. It can also be specified via the hibernate.tenant_identifier_resolver setting. The first situation is when the application is using the org.hibernate.context.spi.CurrentSessionContext feature in conjunction with multi-tenancy. In the case of the current-session feature, Hibernate will need to open a session if it cannot find an existing one in scope. However, when a session is opened in a multi-tenant environment the tenant identifier has to be specified. This is where the CurrentTenantIdentifierResolver comes into play; Hibernate will consult the implementation you provide to determine the tenant identifier to use when opening the session. In this case, it is required that a CurrentTenantIdentifierResolver be supplied. The other situation is when you do not want to have to explicitly specify the tenant identifier all the time as we saw in Example 16.1, “Specifying tenant identifier from SessionFactory”. If a CurrentTenantIdentifierResolver has been specified, Hibernate will use it to determine the default tenant identifier to use when opening the session. Additionally, if the CurrentTenantIdentifierResolver implementation returns true for its validateExistingCurrentSessions method, Hibernate will make sure any existing sessions that are found in scope have a matching tenant identifier. This capability is only pertinent when the CurrentTenantIdentifierResolver is used in current-session settings. Multi-tenancy support in Hibernate works seamlessly with the Hibernate second level cache. The key used to cache data encodes the tenant identifier. Currently schema export will not really work with multi-tenancy. That may not change. The JPA expert group is in the process of defining multi-tenancy support for the upcoming 2.1 version of the specification. The approach above is valid for the DATABASE approach. It is also valid for the SCHEMA approach provided the underlying database allows naming the schema to which to connect in the connection URL. * users might use the ALTER SESSION SET SCHEMA command; etc. // on error, throw an exception to make sure the connection is not returned to the pool. This approach is only relevant to the SCHEMA approach.